Even before the opening of Bumble and Wild in Shipston on Stour, myself and Heidi have always been keen supporters of all the work they do. It is fantastic having a charity right on our doorstep helping people get their wishes of staying at home when this normally would not be an option. Since opening Bumble and Wild in September 2015, Rebecca, Debbie and all involved within Shipston Home Nursing have been huge supporters for us. It is lovely that we can now also be of support to them. Bumble and wild, it says it all in the name. We adore bees and strive to use all seasonal flowers and british when possible, we even try and grow a few ourselves. that idea of bringing the outdoors in, it just seems so right. Our talented and friendly staff are always on hand to give advice and ideas to help you create the perfect bouquets. We also offer a wide range of plants, seeds and bulbs (when in season) for those of you after a little something to brighten up the outside of your home. 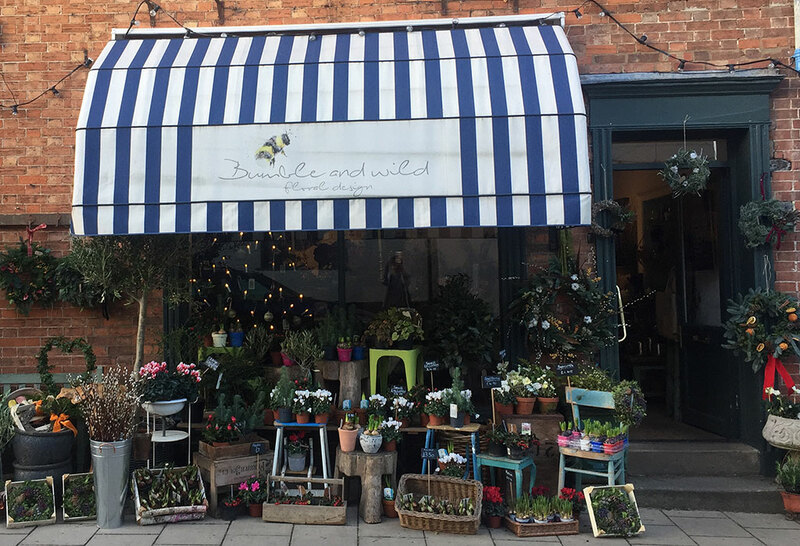 Bumble and wild is situated in a quaint little town called Shipston on Stour on the outskirts of the cotswolds. Our thriving indepently owned florist is one of many beautiful boutique shops within the town. Please pop in or call anytime (during opening hours of course) to place orders, chat about weddings, discuss sympathy flowers or grab a little posie.